While I was busy doing giveaways, the Tooth Fairy was busy shelling out money visiting our Trenches. 2 times in 2 days, as a matter of fact! It had been a while. Eldest lost ALL 4 of his bottom teeth over a year ago. His adult teeth have already come in. But none of his teeny, tiny top ones were budging. Until one day, we realized that he had 3 loose. He wiggled, and wiggled, and played, and nudged, and wiggled. So last Saturday morning, one was literally hanging by a thread. But my tough little football guy was too scared to pull it. So I sneak-attacked and grabbed Eldest by an arm and a leg and Hubby flicked it out of his mouth, tag-team style. Eldest was unconcerned. "You're the tooth fairy, anyway", declared my bold 8-year old, shrugging his shoulders. "Besides, you and dad already owe me $7. So I don't care." Stunned, I responded, "Why would I want your yucky teeth? What would I do with them? And besides, I never have any money. So how could I give it to you?" Of course, my Rainman had this all thought out already. "You just throw the teeth away. You get the money from Dad." "Yeah, of course they are real. Just not the tooth fairy, Mom." I left $2 for the little turd. Sunday, lo and behold, another tooth was hanging. Hubby wasn't home, so I had the honor of yanking it that evening. Needless to say, we promptly bagged the sucker. I came up with a plan. "So if you think I'm the tooth fairy, how about this? I don't have any money. And when Daddy gets home, I won't even tell him you lost a tooth. Just put it under your pillow and we'll see if the tooth fairy is real. How about that?" Because now I totally can't tell whether I convinced him or whether he's just humoring me. Hubby and I went to Maine this weekend ALONE! Read about it here. i am sooo not looking forward to losing teeth days...totally grosses me out! Too funny! 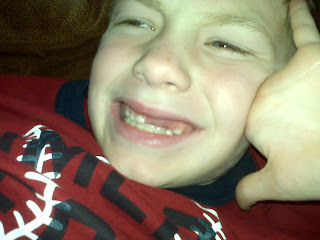 My son keeps singing, "All I want for Christmas is my 5 front teeth". Yea, 5...his newly acquired lisp is adorable!! Haha! JUST NOW (I swear!) my 6 year old came to me and asked whose tooth she had just found. Oops. 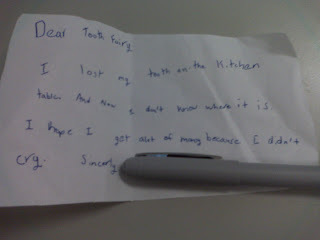 I guess I should start throwing them away after the tooth fairy visits, huh? That was genius to tell him Dad doesn't even know. But that $5....with two more sibs underneath him...you are in for it! I live in fear of them figuring out "The Truth". My mom had the best reasoning ever when we started questioning: "All I ever do is tell you to clean up your toys. Why in the world would I ever go out and buy you more?" The logic was too sound to dispute. I plan to use it when the time comes. Wow, that's a lot for teeth! I think I'll have to make the rule that if you don't believe=no tooth fairy money! teeth are expensive...good to know since our son is only 2. SO jealous your kids are losing their teeth "on their own". My daughter will be enjoying some giggle gas in Jan to help her along. I wonder if the tooth fairy has to leave more to pay for the trauma that comes along with a visit to an oral surgeon at 7 years old. Dang it. my daughter TOTALLY busted the tooth fairy once. guess I was banging into stuff in the dark, big surprise. On behalf of your kids, I want to thank you for being a good Tooth Fairy. My mom, though her intentions were good, was always the WORST tooth fairy ever. I'd wake up and wail that my tooth was still under my pillow, and my mom would be all, "Oh, just go pee and brush your teeth. Maybe the Tooth Fairy's just running late." And what do you know - when I got done in the bathroom, lo and behold, the straggling fairy had always made her visit. And left me a whole quarter. My six year old lost one of her top center teeth and the other one was loose. I actually encouraged her to work on the loose tooth so "we could sing the song." I'm either a terrible mom or a total dork. On the up side, she has actually master whistling now.